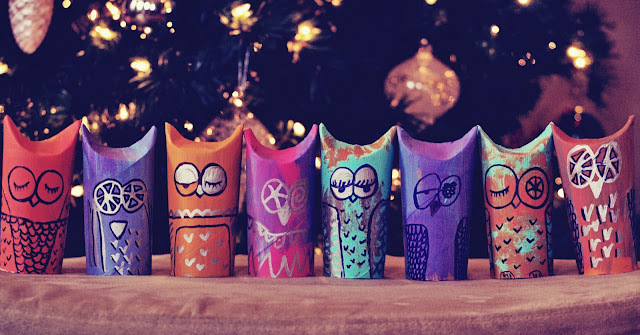 Well, being that things have finally cooled down for a second and the holidays are on a slight hiatus, now is the perfect time to settle in and have a little fun with a simple, cute DIY project to bring a smile to anyone's face. 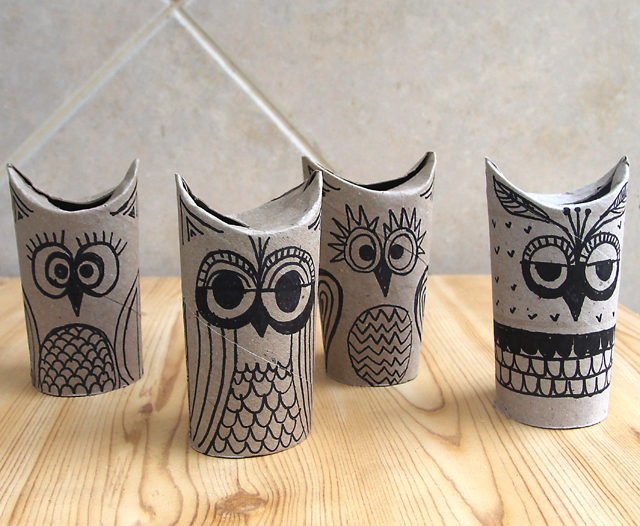 And these adorable paper roll owls via The Centsible Life are just the thing to do it! 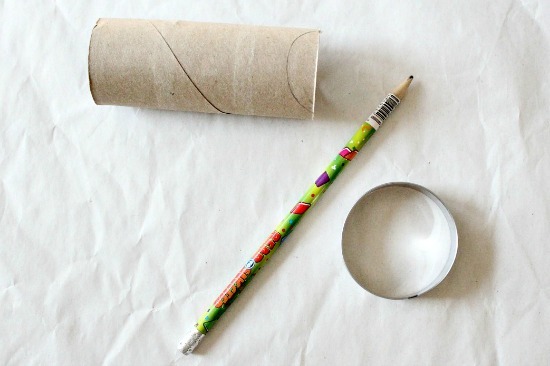 Costing basically nothing and easy to throw together with supplies you already have (some in the bathroom, ha ha ha!) 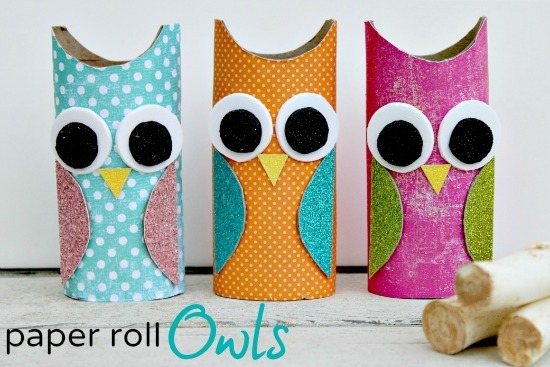 you can turn a perfectly terrible middle of the week slump around in no time! 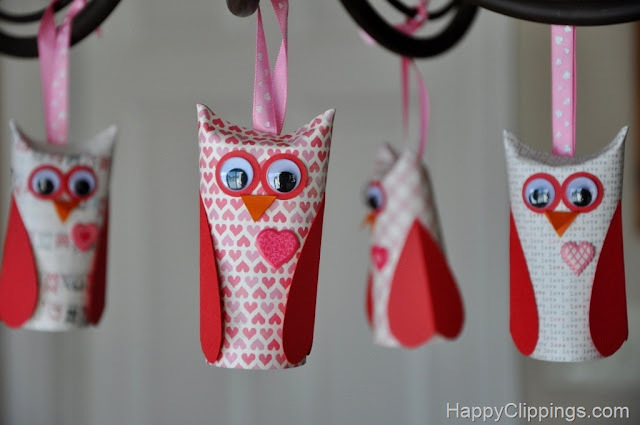 Go ahead, line your office desk with these at work, throw a few on your windowsill, or surprise your little one with a few new wise friends waiting on the night stand when they wake up from their nap! Here's what you do . . . 1.) 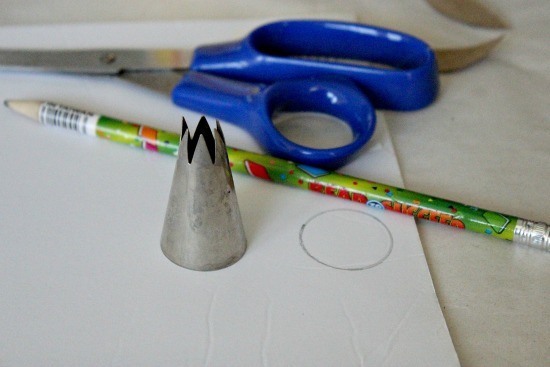 Begin by drawing a half oval at the top of the paper roll, I used a cookie cutter as a stencil for mine. 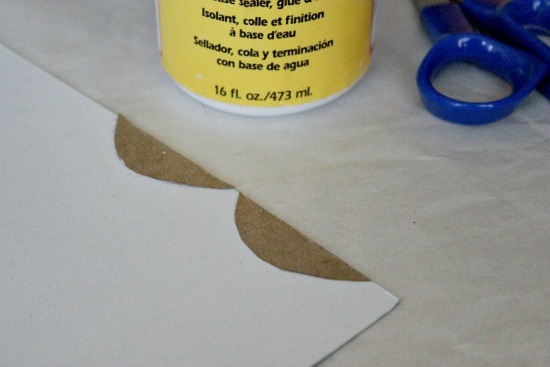 Cut the circle out and use it as a template to cut an identical one from the back side of the paper roll too. Don’t throw the cut pieces away, set them aside because you will use these for the wings shortly. 2.) 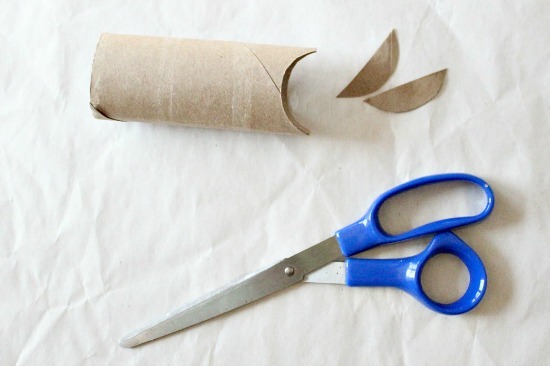 Place two fingers inside the paper roll and cover it in glue. Roll the paper roll onto the scrap paper then trim accordingly. 3.) Set aside to dry for a bit. 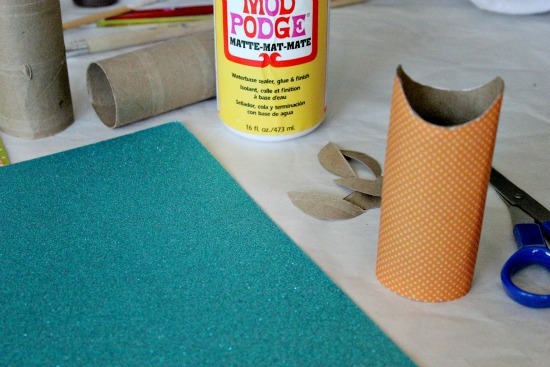 Cover one side of the two pieces you cut off the paper roll in glue and place onto the back of the glitter card stock. Set aside to dry. 4.) Next, you are going to cut the white and black foam to make eyes. I used a couple of icing tips to size mine. 5.) 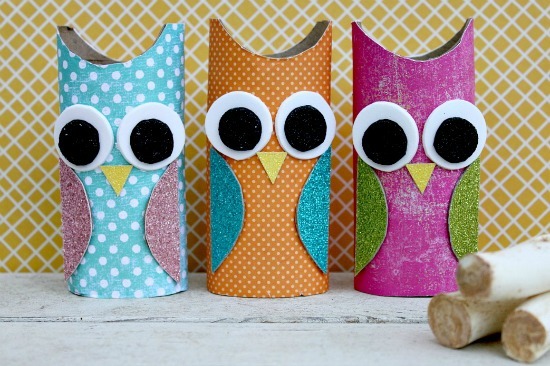 Cut out a small beak from yellow glitter card stock. 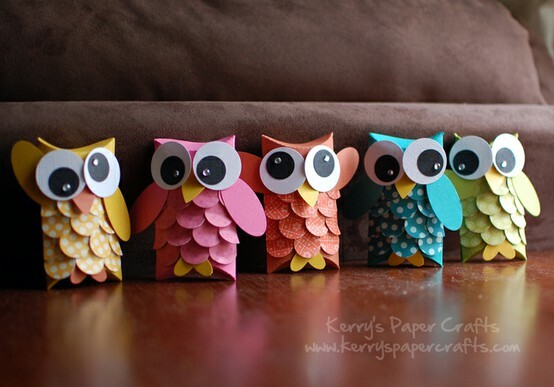 Attach the eyes, beak, and wings using glue where needed. Set aside to dry, and you are done. Some more inspiration . 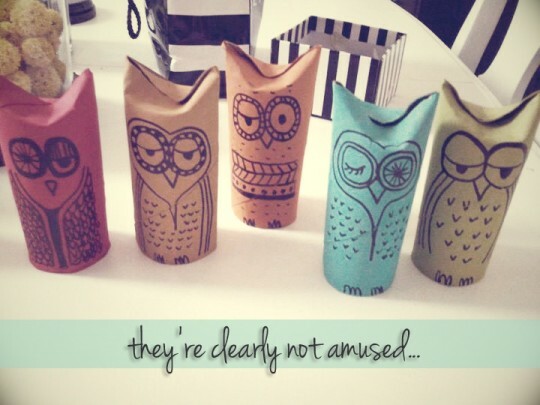 . .
Now you know me, I am always thinking of gender reveal parties....so if you wanted to purchase our Owl gender reveal invitations right here...and throw a little party for your friends & family, one of these little cuties on each of the place settings at the party and filled with blue or pink confetti (and covered on the bottom) would make an excellent way to announce boy or girl, don't you think?? I LOVE IT! !